When we dine out I guess I told a lot of times our first go to cuisine is Japanese, but what’s the next option if Japanese is unavailable? 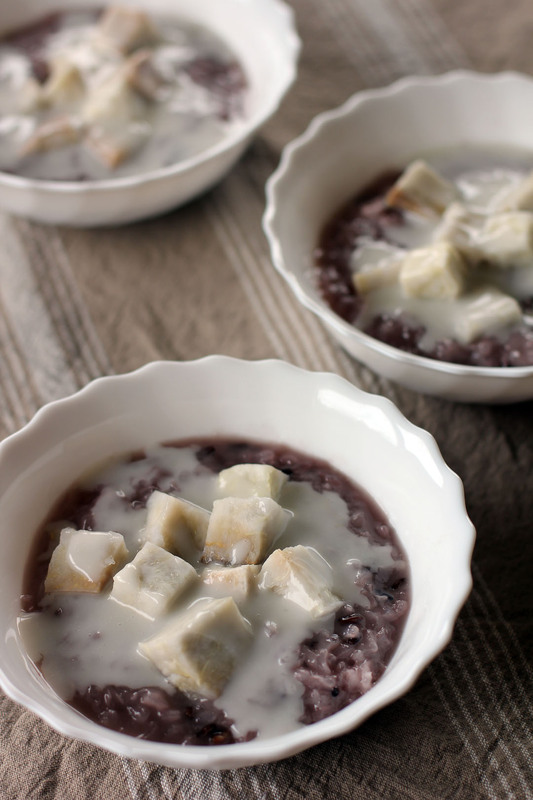 Well it will be Vietnamese and we do love their noodle dishes but Vietnamese is not just about noodles they also have great desserts and one of it is this one Taro & Sticky Rice with Coconut Cream. Last time we dined into one we ordered this dessert and I told my wife, “We will so make this at home”, I know it’s easy as it has a similar concept to a Philippine dish called “Guinataang Halo Halo”. So several weeks later here I am making my own version at home and here is how it goes. In a pot boil the water, once boiling add the taro and cook for 15 minutes or until taro is tender. Scoop out and set aside the taro leaving liquid in the pot. Add the coconut milk sugar and salt bring it again to a boil. Rinse glutinous rice then place it in the boiling mixture, turn heat to low then cook rice for 15-20 minutes or until rice is soft, occasionally stir to prevent rice sticking from the bottom of the pot. Turn heat off, there should be a small amount of liquid remaining don't worry about this as the rice will absorb this reaming water. In a saucepan combine all coconut cream sauce ingredients, bring it to a boil then let it thicken. Turn heat off. 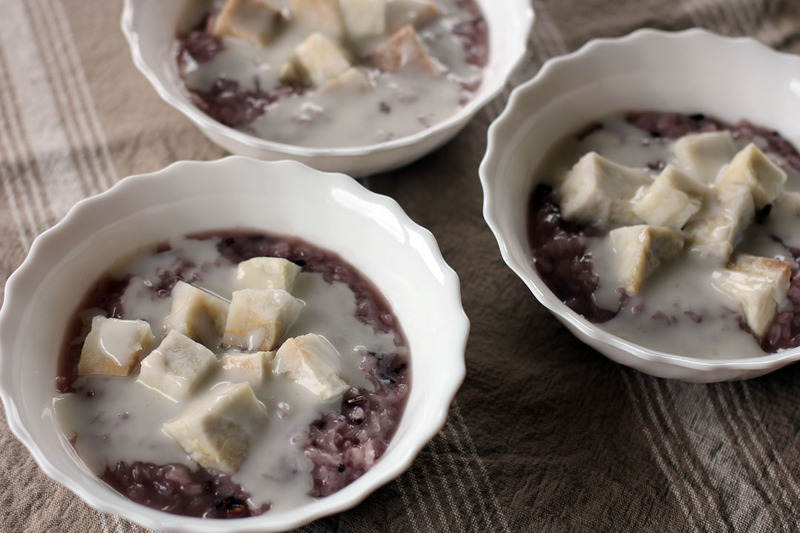 Scoop some rice pudding into a bowl, top with several pieces of taro then pour some coconut cream sauce on top. Oh my gosh! This looks so crazy good! I went to visit Manila for the first time with my b/f and had vegan Filipino dishes 🙂 I was surprised that a lot of Filipino dishes are similar to both Japanese and Chinese cuisine! This sounds like a sweet and satisfying dessert. I’m always impressed how you recreate restaurant dishes at home with such ease. This looks delicious. Love, love, LOVE! So decadent. Just yum! There are so many different versions of this dessert and I know friends who love it though I find it a little too rich. Raymund, I have not had this combo for a while…looks delicious, I love the texture of this dessert…yum! I do love a good rice pudding, but I’ve only had the ones with raisins, never one with taro. With the coconut cream I bet this is delicious! that’s made some bad memory about it…. Am getting my stash of black sticky rice incoming from Laos through a colleague pretty soon. This is on the top of my list! Yum! Vietnamese is great. This combines all of my favorites into one! Wow. Gorgeous photo too. I think every culture has its own form of rice pudding, I’d love to try this one day. When we have Vietnamese I am usually too full for dessert. This looks so good, thick, rich and creamy. We call it bubur cacar in Malaysia. Add some sweet potatoes, nice too.